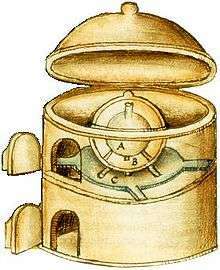 In alchemy, an athanor is a furnace used to provide a uniform and constant heat for alchemical digestion. Etymologically, it descends from a number of Arabic texts of the period of the Califate which use the term "al-tannoor" in talismanic alchemy, meaning a bread-oven, from which the design portrayed evidently descends. In the work Life of Apollonius by Philostratus the Athenian, an allegorical description is given of an occult hill. The author gives this hill the name "Athanor". Athanor is also the name of two works by Anselm Kiefer: one currently displayed in the Toledo Museum of Art and the other commissioned by the Louvre museum in 2007 and displayed there. Athanor is also the name of a musical work for orchestra by French composer Joël-François Durand, written in 2001 and premiered by the BBC Symphony Orchestra (cond. Pierre-André Valade), in 2003. Athanor is also the name a series by American author Jane Lindskold. The titles in this series are Changer, published in 1996, and Legends Walking, published in 1999. Athanor is also the title of an artwork by Romanian artist Geta Bratescu (b. 1926), consisting of a photo collage dated from 1974 and currently part of the art collection of Instituto Inhotim, in Brazil. Athanor is also the title of an artwork by Janet Saad-Cook located at Boston University's Photonics Center. Athanor is now a review of language philosophy, history, and international politics. It is published once or twice a year. Its latest issue has been No. 13 (new series), November, 2009. French composer Joël-François Durand composed an orchestral piece called Athanor from 2000 to 2001.